No more birthday suits, please! I visited 29 Spa this week-end; my massage was fantastic and I wanted to live in the spa…really amazing place! I have visited a few nice spas in my life, but 29 offered me something I have never seen before…a disposable bathing suit…brilliant idea! Why didn’t I think of that? 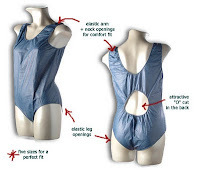 And, why doesn’t every spa offer disposable suits? I would much rather see a spa full of people wearing this suit than the invisible one that is “worn” in far too many spa locker rooms (in my humble opinion)…trust me – this suit is more flattering!